Blaster Pen A lightweight, easy to control, sandblasting pen. Tungsten-Carbide Blasting Nozzle Two premium, long-lasting quick release carbide sandblasting tips are included. One .060 round for general work and one calligraphy writing tip. 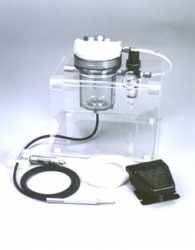 Complete Pressure Pot Assembly This portable regulating system is the heart of the sandblaster. The pressure pot holds 5 pounds of aluminum oxide. Easy top fill. Unit has a self-contained regulator to adjust your sandcarving pressure (20-45 psi). Also included is an automatic moisture trap. This removes unwanted moisture from your airline automatically. Foot Control Lightning fast on/off foot pedal controls the air flow to the handpiece for precise control. Instructional Video System set up and maintenance with sandcarving techniques. Instructional Manual Complete instruction manual for operation.